The updated 'Beyond by Gelert' range brings together Gelert's 30 years of camping know-how with the latest in materials and innovations plus contemporary looks and features for today's family camper. The Meridian 6 is a new addition to the range. 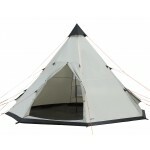 Like its bigger brothers, it's a fibreglass framed family tunnel tent that offers lots of space, total comfort, plenty of features, quality materials and assembly but all at a sensible price. The living space of the Meridian 6 is a full 6.0m² and the bedrooms accommodate 3 at each end of the tent (Stan loves threesomes). 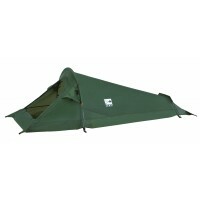 The comfort is provided by virtue of the fully sewn-in groundsheet for a sealed internal environment and an external 12.7mm fibreglass frame to allow for flysheet first pitching. 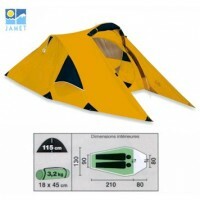 The quality materials include a fire retardant polyester flysheet offering 5000mm hydrostatic head protection and colour co-ordinated bedroom inners and curtains. 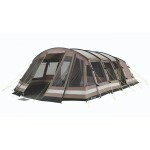 Other key features include two large 'privacy windows'; hanging organiser pockets; two large panel doorways which for 2011 have an eyebrow pole above for increased weather protection; one pair of porch poles; welded and reinforced polyethylene groundsheet; water repellent zips; electric cable access point; multiple ventilation points along the roof line; pre-attached guylines; 'slick sleeves' for easy pole threading; breathable polyester inner tents, tent accessory pack, extra large storage bag; contemporary flysheet panel design. 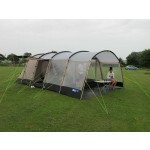 Optional side porch, footprint groundsheet and carpet available - see below. 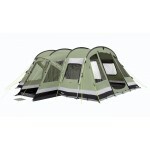 Beyond by Gelert Meridian 6 Family Tunnel Tent - 2011 Model.